Welcome to another edition of the OrvisNews.com Friday Film Festival, in which we scour the Web for the best fly-fishing footage available. This week’s collection features great videos from Europe and the Americas, running the gamut from huge sailfish off the coast of Costa Rica, to Texas largemouths, to smallish “ugly” trout in Sweden. Every week, I think, “Surely we’re going to run out of great fly-fishing video one of these. . . I had a great day fly-fishing in on Saturday at Big Branch and Roaring Branch–my first time fly fishing, after 25 years of working for Orvis. Thanks to Steve Hemkens for his patience and instruction. I lost a half dozen flies in the trees and only set the hook on about 10% of the strikes, but I did land about 10 small, native brook trout. I’m looking forward to doing it again. Here are some things I learned about brookie fishing in the Green Mountains: . . . The Greatest Graffito of All Time? Graffiti is often a blight, but this ingenious artwork is a peaceful demonstration against the continued presence of a California dam that serves no purpose, yet keeps the Ventura River from flowing free and blocks the migration of anadromous fishes. This passage from the website of the Matilija Coalition explains the problem: . . .
Capt. 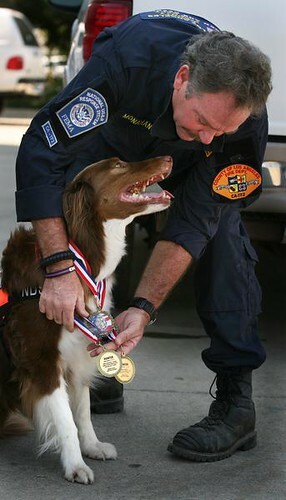 Billy Monahan and Hunter show off the border collie’s well earned medals. A great story In yesterday’s Bakersfield Californian describes how a local border collie named Hunter was honored for his service as a search dog in Japan after the recent tsunami and in Haiti after the 2010 earthquake. The recipient of the American Kennel Club’s 12th annual Humane. . . The Popsicle has been around since the 1980s, when young George Cook was guiding in the Bristol Bay region of Alaska, and it’s part of a group of patterns he created called the Alaskabou Series. Cook, who is now a well known casting instructor and industry representative, used marabou as a base for the pattern and added some flash. The result is. . . I wanted to share with Orvis these pictures of my son, Jake, playing and releasing bonefish in Nassau earlier this month. 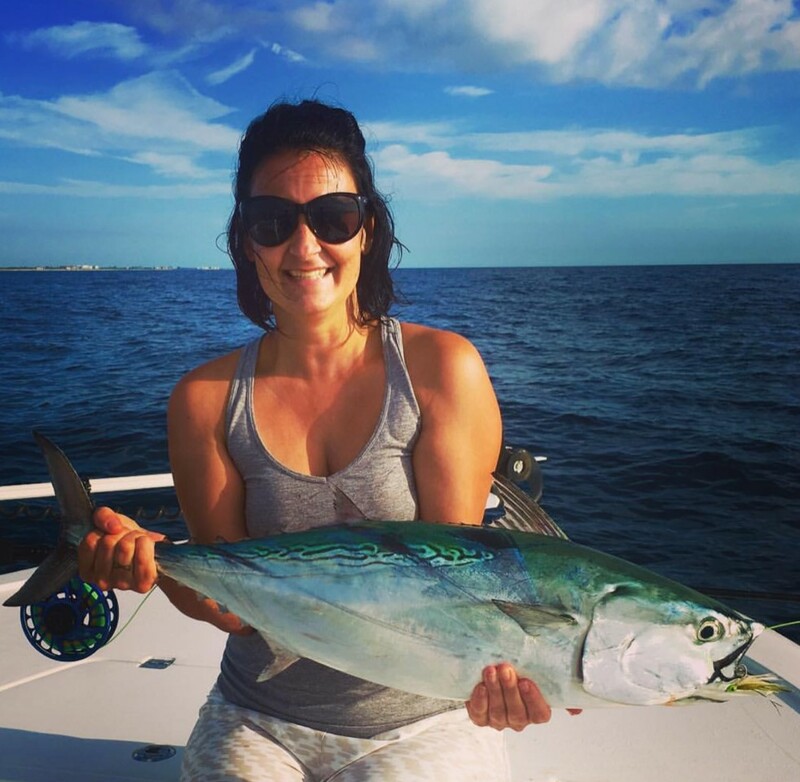 Last year, while on a family vacation, we went on his first bonefish charter (in Nassau), and that time we had to run away from Hurricane Earl. This year we had to delay our trip due to Hurricane Irene, which had those of us. . .
A native, wild golden trout from the headwaters of the Kern River. It only takes about 12 miles of hiking at 11,000 feet (give or take a few inches) to get there. What could be easier? Scott Chandler, better known as Older Bro on The Trout Underground, captured this absolutely gorgeous trout over the weekend. For my money, it’s the only species that can compete with brook trout for stunning colors and patterns. More and more dogs in Iraq and Afghanistan are saving the lives of soldiers in the field. As an article in today’s USA TODAY states, this has come at a price for the dogs involved. Since May 2010, 14 military working dogs have been killed in action. Six others have been wounded, and three are missing in action, according to U.S. Central Command. In addition, incidents of canine post-traumatic stress disorder are on the rise, said Lt. Col. Richard A. Vargus, chief of the law enforcement branch at CENTCOM. 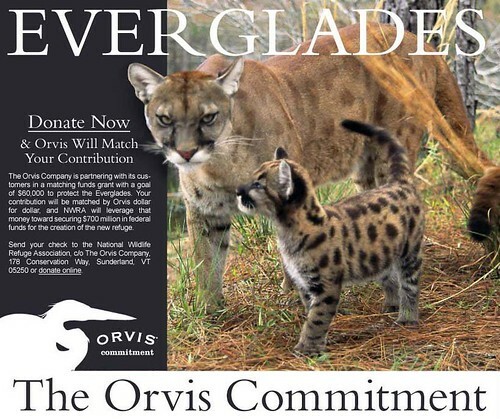 One of the five Orvis Commitment initiatives for 2011 is working with the National Wildlife Refuge Association to help preserve the unique habitat of the northern Everglades south of Orlando, Florida. Yesterday, National Public Radio featured a story on the innovative ways. . .